The magnitude of the present monetary disorder defies description. Advocates of reform are lost in a maze of treatments for symptoms and concrete solutions are conspicuous by their absence. In each case the cure proposed is worse than the disease. Many agree it is imperative a solution be found if we wish to avoid a cataclysm in world events. What must be comprehended is the gravity of the situation is world wide — what is at stake is not just a panic of the magnitude experienced in recent history, but also a loss of the facility of trade and exchange so vital to the very existence of a civilized society. As hopeless as the situation may appear, it is by no means futile. What is needed is the leadership that somehow miraculously seems to appear in such times of crises, to lead us out of this monetary disorder by reversing the process that led us to where we are today. Archaeologists believe European and Asian tribes routinely met to exchange goods in the Ural Mountains about 12,000 years ago. Wage and price controls are over 5,000 years old. Tax cheating is 4,000 years old. The first monetary devaluations occurred in Greece, 6th Century B.C. Emperor WooTi came up with Income Tax around 140 B.C. and Cosimo deMedici (1389-1464) thought up the soak the rich plan (graduated income tax). In the 17th Century, European nations followed an economic philosophy known as Mercantilism. Mercantilists believed that nations remained powerful and wealthy amassing gold and silver by selling more merchandise than they bought. They established colonies and took raw materials and precious metals from these new lands while selling them goods. Gold and silver were metals with particularly tenacious resistance to erosion and required great amounts of labor to mine and refine. Because gold and silver were fungible (highly divisible without losing value) they were an excellent medium of exchange. They were particularly desirable in coin form and coins would command more goods than commodities in non-coin form. The Chinese used gold cubes as early as 2100 B.C., and the Bible mentions precious metal coins. The Lydians in West Turkey cast crudely inscribed silver pellets, the earliest known coins, around 700 B.C. Gold and silver coins were the most accumulating wealth through time and a preeminent source of independence. As private property of high value, in small space, gold and silver were immediately acceptable mediums of exchange for the goods and services of others. All manner of barter was possible using highly divisible and stable parity gold and silver coins, down to the smallest weight. All transactions were immediately and satisfactorily concluded with the exchange of gold for goods. The people of any nation were independent of the state as long as they owned gold and supported government with its use. A disadvantage of this system was that large quantities of gold and silver coin were difficult and unsafe to transport. This disadvantage led to the forerunner of our banking system — the goldsmiths. People departing on long trips began leaving their coins with goldsmiths for safekeeping. The goldsmiths in turn would issue the traveler a receipt. At their destination, a receipt was exchanged for gold coin by an associate of the goldsmith. The receipts became so popular people began paying debts with them rather than gold coin. This marked the beginnings of paper currency and the idea of money was born. It is important to note that the true function of the receipts was their ability to serve as proxy for the gold and silver coins, and they introduced a time factor to exchanges that differentiated them from actual barter. Around the same time, people began paying bills with letters instructing goldsmiths to give coins to the holder of the letter. These letters (which we now call checks) began another phase in the gradual revolutionary move from independence to interdependence. Early paper monies were promissory notes that represented precious metals. They could redeem gold or silver coins at a goldsmith or treasury. Paper money, which the Chinese were already using around 1200 A.D., grew rapidly in America. Several Colonies in the late 1600s issued paper money to pay bills until enough taxes could be collected in gold and silver coin to buy the paper back. As long as the Colonists believed the paper would be bought back, or be able some time to redeem coin, it was accepted. But, if they had doubts, the paper was shunned. Although paper money problems were well known then, the Continental Congress had to finance an army and, without taxing powers, turned to the printing press. This currency, as we manage it, is a wonderful machine. It performs its office when we issue it; it pays and clothes troops, and provides victuals and ammunition; and when we are obliged to issue a quantity excessive, it pays itself off by depreciation. But Congress issued so many Continental dollars that the huge quantity being bid against much sought after goods and services, soon had prices soaring. In 1780, one hat and a suit of clothes ran $2,000.00. The cost of flour had reached $1,575.00 a barrel. A haircut reached $150.00 before the barbers stopped accepting currency as payment and used it for wallpaper. Congress responded to all this by printing more Continental dollars which simply made matters worse. In March of 1778, $1.00 in coin (English, Spanish, widely circulated in the Colonies) was worth $1.75 in Continental notes. A year later $10.00 in paper currency was worth $1.00 in coin. By May 1781, the figure soared — between $200.00 and $500.00 in Continental paper for a dollar in coin. The public coined a phrase: “not worth a Continental.” For all practical purposes, all money issued by Government was worthless. A large barrel of rum in Boston was $8,000.00, and within six weeks the empty barrel was worth $12,000.00. That same year, 1781, a Boston housewife was lucky to get a pound of rancid salt port for $375.00. Legislation on the subject grew bitter; but finally, in June, 1781, all the legal Tender Laws were repealed. The Financial History of the U.S., 1774-1789 by Albert Bolles. It was finally decided, by the vote of nine states against New Jersey and Maryland, that the power to issue inconvertible paper should not be granted to the federal government. An express prohibition, such as had been adopted for the separate states, was thought unnecessary. It was supposed that it was enough to withhold the power, since the federal government would not venture to exercise it unless expressly permitted in the Constitution. “Thus,” says Madison, in his narrative on the proceedings, “the pretext for a paper currency, and particularly for making the bills a tender, either for public or private debts, was cut off. In 1789, it became rather common knowledge that paper money, defined as a substitute for taxation, gave every opportunity to the tricky, deceitful person of any community, to cheat and defraud his neighbors, and all under the sanction of solemn acts of legislative authority. Every lover of his country will therefore be solicitous to find out some speedy remedy for this alarming evil. There is no possible substitute for the loss of commerce. Our first grand object, therefore, it its restoration. I presume not to dictate or direct. It is a subject that will require the deepest deliberations and researches of the wisest and more experienced men in America to fully comprehend. It probably belongs to no one man existing to possess all the qualifications required to trace the course of American commerce through all intricate paths and to those and only those that shall lead the United States to future glory and prosperity I am sanguine in the belief of the possibility that we may one day become a great commercial and flourishing nation. But if in the pursuit of the means we should unfortunately stumble again on unfunded paper money or any similar species of fraud, we shall assuredly give a fatal stab to our national credit in its infancy. Paper money will invariably operate in the body of politics as spirit liquors on the human body. They prey on the vitals and ultimately destroy them. Establishment of the U.S. Mint in 1792 saw the beginning of the end of the worst period of inflation (fiat — “paper money”) this country had ever experienced until that time. Sec. 11 and be it further enacted, that the proportional value of gold and silver in all coins which shall by law be current as money within the United States. Sec. 16 and be it further enacted, that all the gold and silver coin which shall have been struck at, and issued from the said mint shall be a lawful tender in all payments whatsoever. Sec. 19 and be it further enacted, that if any of the gold and silver coins which shall be struck or coined at the said mint shall be debased … every such officer or person who shall commit any or either of said offenses, shall be guilty of felony and shall suffer death. In a system known as free coinage the Mint accepted precious metal bullion from anyone and replaced it with fabricated coin of equivalent worth, because the new U.S. Treasury, formed in 1789, lacked enough precious metal to issue all the coin the growing economy needed. U.S. money needs were met by private banks chartered to operate by state governments. Banks accepted deposits of gold and silver coin and made loans and payments in their own notes which were able to redeem the gold and silver coin. The banks had to keep the precious metal coin reserve on hand to meet redemptions. However, a few years earlier, in 1775, Scottish philosophy professor Adam Smith had published a book, The Wealth of Nations, which argued that the source of national power and wealth was not gold and silver but production of goods. Smith's book became the cornerstone of a new social science — Economics. His writings and those of his contemporaries, slowly turned Europe toward improving production and developing interdependent trade. The goldsmiths (modern day bankers) had already seen the advantages of issuing paper in excess of gold coin on hand to be redeemed. In the early 1800s, America had many honest well-run banks, but others earned reputations more for fraud than integrity. Wildcat banks got their name because they were located in regions so remote and hostile that wildcats, not note holders, came to their doors. Before state laws regulated banks, bankers knew they had to keep a certain amount of precious metal coins on hand to be redeemed upon request of note holders. To assure the public that reserves were available, vaults were often located where customers could view the precious metal coins. But other bankers were not quite as truthful. They would sprinkle gold or silver coins on top of kegs of nails. In later years when state examiners checked reserves, some slick operators would ship coins from bank to bank minutes ahead of the examiner. The banks took in gold and silver deposits and made loans and payments in their own notes which, as mentioned earlier, could redeem gold or silver coin. State bank notes worked well in local areas if people were sure the issuing bank was in good condition and its notes could redeem coin. Outside their local areas, notes were often accepted only at a discount (less than face value) because merchants did not know how honest and scrupulous the issuing bank was. If depositors feared a bank could not honor all of its outstanding notes, they rushed to draw out deposits and redeem gold and silver coin before the reserves disappeared. Despite panics and failures, state-bank notes were widely used during much of the 1880s. By the early 1860s more than 10,000 separate issues of different sizes, colors, and designs were in circulation. The Civil War produced changes that set the stage for today’s money system. The federal government could not raise enough money to pay for the civil war through bond sales and taxes. As rapidly as the Treasury paid bills with gold and silver coin, the metal was hidden by the public as private property. Congress issued paper money — U.S. Notes — that was not able to redeem gold or silver coin. Congress tried to make the notes acceptable by declaring them Legal Tender which meant they had to be accepted in payment of all private debts. The government also began chartering National Banks which were given paper currency they could issue as their own. State banks were stopped from issuing notes. The public was told that National Banks received currency in proportion to the amount of government bonds they purchased. No one stopped to think! The government printed the bonds and the currency. The currency was given to the national banks with which to buy the bonds. This particular piece of trickery was to make the public believe that the currency in circulation was backed by the government bonds held by the bank issuing them. Remember the currency was given to the National banks to issue as their own. The real reason for the deceitful trickery was to divert gold away from public ownership. In public hands gold is independence; in the hands of any other authority — the public becomes interdependent on that authority. Jay Cooke, a Philadelphia banker, was commissioned as a secret agent of the U.S. Treasury to accomplish this. The public was educated to look at government debt as a national blessing IF the public could cash-in on it. Government bonds that were payable in gold could only be bought with paper currency (greenbacks). To get the greenbacks the public would deposit gold. The story was that if you held gold, the amount didn’t increase over time. But if you deposited gold, got greenbacks, bought bonds, held bonds to maturity, you would then have more gold (the bond interest plus principal at maturity). He stated that $1,000.00 in gold invested in five-twenties (bonds) would in five years be worth $2,000.00. Prudence and self interest, it was said, dictated that there should be no time lost in subscribing. The public fell for it: Hook, link, and sinker. The paper currency became Legal Tender by public compliance. The government could print bonds and currency as fast as the presses would go and the public forced its gold upon the authorities to get the bonds and the paper currency. Nothing could be more clearly expressed than this.” As Mr. Justice Field observes, in his able dissenting opinion in the recent case of Juilliard vs. Greenman, “If there be anything in the history of the Constitution which can be established with moral certainty, it is that the framers of that instrument intended to prohibit the issue of Legal lender notes both by the general government and by the states, and this prevents interference with the contracts of private parties.” Such has been the opinion of our ablest constitutional jurists, Marshall, Webster, Story, Curtis, and Nelson. There can be little doubt that, according to all sound principles of interpretation, the Legal Tender Act of 1862 was passed in flagrant violation of the Constitution. The greenback was then and for years afterwards one of the most hotly and ill-naturedly debated subjects in the financial policy of the United States. One stop on the way to evil easily leads to others. Though Mr. Chase (Secretary of the Treasury) was a reluctant convert to the Legal Tender when the first law was passed on February 12, 1862, it was less than five months, on July 11, 1862, until a further emission of greenbacks, $150,000.00 was authorized, thus doubling their amount. The public went overboard for the bonds and the currency with which to buy them. Questions to Jay Cooke and his answers about the bonds will help to explain why the public was fooled into compliance. Question: Do you take only Legal Tender notes? Answer: Legal Tender Notes or checks upon Philadelphia or New York that will bring Legal Tenders, are what the Secretary allows me to receive. Question: Do you sell the bonds at par? Answer: The bonds are sold at par, the interest to commence the day you pay the money. Question: What interest do you pay? Answer: The bonds pay six percent interest in gold, three percent every six months, on the first day of May and November at the Mint in Philadelphia, or at any Sub-Treasury in New York or elsewhere. Question: How does Secretary Chase get enough gold to pay this interest? Answer: The duties on imports of all articles from abroad must be paid in gold, and this is the way Secretary Chase gets his gold. It is now being paid into the Treasury at the rate of Two Hundred Thousand Dollars each day, which is twice as much as he needs to pay the interest in gold. Question: Will the face of the bonds be paid in gold when due? Answer: Congress has provided that the bonds shall be paid in gold when due. Question: Will I have to pay the same tax on them as I now pay on my Railroad, or other bonds? Answers: No! You will not have to pay any taxes on these Bonds if your income from them does not exceed $600.00; and on all above $600.00 you will only have to pay one-half as much Income Tax as if your money was invested in Mortgages or other Securities. Those who neglect these six percent Bonds, the interest and principal of which they will get in gold, may have occasion to regret it. No. 114 5. Third St., Philadelphia. The public was told it was utter folly to hold gold with such a good investment available. The huge national debt being accumulated was considered by Secretary Chase to be “small compared with that of Great Britain or France, whilst our resources are vastly greater.” Here was a reference to the economics of Adam Smith that the wealth of a nation was its potential for production of goods from resources. The currency was backed by the future productivity of the public. The history of the world may be searched in vain for a parallel case of popular financial support for a Government accumulated national debt. Having once committed ourselves, and having a vast number of agents through the country, our government loan agency expending vast sums with the newspapers for advertisements, we felt that we had a right to claim their columns in which to set forth the merits of the new national banking system. Gold was steadily advancing in parity with paper as time passed and the government issued increasing amounts of paper money. The strong guiding hand of Mr. Cooke no longer dominated the stock exchange and the newspaper press. He embraced every opportunity to attack those who sought to profit by the traffic in gold. The city of New York, whilst containing … many noble and patriotic citizens and institutions, was undeniably the centre … filled with foreigners … and disloyal politicians, it became the centre of speculation in gold and every species of material and produce while could be turned into gold by trans-shipment abroad. This speculation and the rise in the price of specie were so persistent and continuous that even many good citizens thoughtlessly entered the trade and thus contributed to the depression of our bonds and currency … the editors I employed were instructed to make constant warfare upon this speculative disposition and to portray the want to patriotism of those engaged in it. I had on several occasions pleaded with Mr. Chase to allow me to teach these rebels and greenback slanderers a lesson they would not forget and I told him I could do this, and at once bring gold down to a fairer level by the use of only a few millions of the of gold then in the New York sub-treasury, returning the specie at a large profit, if it were required at any time. From an investigation I had made I was sure that not more than $12,000,000.00 to $18,000,000.00 of greenbacks were then held by the New York banks, requiring the sale of not more than $6,000,000.00 or $7,000,000.00 of gold to absorb every dollar of them into the Treasury and to cause them to rise temporarily above bank credits. “I saw at once that we had gone far enough, and that the power of the nation was uppermost … for some time thereafter it only required my visiting New York for the whole tribe of government haters to suspend their efforts. Later Mr. Chase was again forced to call upon Cooke to check the advance on gold. The sale of gold by the government had no permanent effect, however, on the gold market. Speculation continued to rage in New York and the price of gold again resumed its upward course. Chase tried another device, that of meeting the export demand for gold by selling exchange upon London at a rate below the prevailing market rate, but this also proved ineffective. In the meantime, another scheme had been brewing. It was based on the principle that, if the gold market could not be controlled, it should be destroyed. The Act to prohibit certain sales of gold and foreign exchange was passed in June, 1864. It forbade trading in gold futures and all those practices which are special tools of operators on the market, and it also placed limitations on dealing in foreign exchange. Aimed at destroying a central market was the provision which forbade any transaction in gold at any other place than the ordinary place of business of either the seller or purchaser. The gold act went into effect at once. The Gold room was closed. But the price of gold continued its upward flight. Foreign exchanges were thrown into a hopeless confusion. On July 2, 1864 the Act was repealed. Gold continued to rise. The Treasury department had been regulating the gold markets with purchases and sales in a way which was at first necessary, but which when continued indefinitely, could not be justified. After the secret sales were abolished, the Secretary of the Treasury manipulated the markets publicly and the government was relied upon to correct each slight disorder. The government efforts to sustain this explosive and inflated paper system, had so far been marked by great ingenuity, resolution and success. Mr. Cooke's expertise with printer's ink, show-cards, posters, circulars, pamphlets, hand-bills and a variety of devices of the types to catch the eyes, impress the minds and draw the gold from the pockets of the public. All this was done on the most lavish scale with infinite psychological knowledge and it was a factor of very great importance in this gigantic fraud the mere mention of its name terrorized gold holders. The existence of two standards of value, gold and paper, was rapidly leading the county to a most serious crisis which culminated on Friday, September 24, 1869. On this very day, Friday, September 24, 1869, however, the premium of gold had risen so high that, after consultation with the President, word was sent to New York as publicly as possible, ordering Treasury agents to sell $4,000,000.00 of gold and take in that amount on bonds. There was a panic instantly, gold falling from 162 to 133 in fifteen minutes. Taking in the bonds they had to take in the currency also as the gold went out. The amount of bonds used as backing for the currency shrank, and the money quantity declined. Thus, the money quantity appeared inelastic incapable of expanding or contracting when necessary. This inelasticity led to money panics that wracked the nation until 1913, when the banking system was restructured. This idea of the inelasticity of money was an extension of Adam Smith's new social science of Economics. Smith had advanced the idea of a Law of Supply and Demand. Although economists knew for centuries that changes in the amount of money and how quickly it was spent affected business, they did not discover how the relationship worked until this century. In 1911, American mathematician and economist Irving Fisher mathematically proved that doubling a nation's money quantity would double prices. He believed economic booms and busts were maladies caused by too much or too little money. Fisher's combined use of statistics, mathematics and Smith's economics helped start a new approach to economics known as Econometrics. Basically modern econometrics uses Adam Smith's Law of Supply and Demand, when supply of goods exceeds the demand (money), prices fall. When the demand exceeds supply prices rise. The Federal Reserve System was created in 1913 to be responsible for making sure commercial banks do not create so much money that we have rising prices, nor so little that we suffer from falling production and unemployment. That job is not easy; indeed, no central bank has been entirely successful in maintaining the proper balance between too much and too little money. One problem the Federal Reserve faces is balancing monetary policy with government spending and taxing actions fiscal policy. Another problem is that people cannot agree on just how much money is enough. In the 1950s, another American economist, Milton Friedman, substantiated Fisher's theories and concluded that changes in the amount of money are a major influence on our economy’s direction and the pace of production, employment and spending. A stable economy, he said, requires money quantity to increase steadily in proportion to our ability to produce. Friedman's views, known as Monetarism, have vastly influenced how we think about money, and the way the Federal Reserve controls our money. All concepts are based upon the quantity of money vs. productivity. All are premised upon the producers being interdependent upon a Money Creating Authority with power to acquire, hold, or redistribute the fruits of the public's labor arbitrarily. The Federal Reserve System of privately owned commercial banks creates money, directs the policies of government and holds the destiny of the people under its control. Money is the most important subject intellectual persons can investigate and reflect upon. It is so important that our present civilization may collapse unless it is widely understood and its defects remedied very soon. Robert H. Hemphill, Former Credit Manager, Federal Reserve Bank of Atlanta. A medium of exchange must be production itself, or, an irrefutable claim upon production. The producers are Interdependent of any Money Creating Authority with retained right to hold, or distribute the fruits of their labor without interference. The purpose of Monetary Realism is to undo the harm of an error made in 1776 and perpetuated until the present. It is not the quantity of money per se that is the problem. It is the nature of money that permits there being a quantity excessive. The observations of Adam Smith, Irving Fisher and Milton Friedman can be considered valid only to the degree that their observations embraced all relevant factors. All the usual ways of explaining the Law of Supply and Demand can be used to explain the Law of Competitive Bidding. The quantity of money insofar as it exceeds the quantity of goods and services can be bid in exchanges and the excess quantity being bid can alter the parity of money in relation to the goods and services. However, if the competitive bidding was done exclusively with the goods and services themselves there could not be any excessive quantity. The gross national product (G.N.P.) is always 100% regardless of the quantity of units produced or hours of labor performed. If only labor performed or goods produced were exchanged by those performing and producing, “Inflation” could not come into being. Being limited to 100% of G.N.P. as the limit of offering (bidding), the demand being supply could not exceed itself and be an excessive quantity. This premise is preeminently fundamental and is the base upon which to understand that precious metal coinage was barter and an absolute opposite to inflation (“money”). That barter (precious metal coinage production) should ever have been called “money” was the greatest perversion of language since the dawn of time. Money, an abstract term and used as a name (money) for a nonentity, allows for the acceptance of concepts that would otherwise be impossible. Since a non-entity is given credibility by having a name, its quantity can be increased or decreased by mental manipulation and physical representation — “Money” represented by a physical token, supports the credibility of its existence. At a time when gold and silver coins (barter) were called money, there was also a non-entity — Banker's Credit — represented by numbers in a ledger and used as a medium of exchange, interchangeable with the gold and silver coin barter. Non-entity — money — must not be confused with notes that represent 100% redemption of 100% reserve gold and sliver coin. Money, represented by banker's paper, was not a receipt for the deposit of coin, but banker's letters of credit were interchangeable with receipts for the actual deposit of coin. Bankers were able to withdraw coin with the paper that was not a deposit receipt. The banker's credit paper constituted the excess quantity of money that circulated alongside of, and was as readily acceptable as, the actual receipts for deposited coin. Using a common symbol ($) for money, eliminated any respective identity of the specific thing deposited. This, along with a double-entry bookkeeping system, facilitated the withdrawal of deposited precious metal coin by receipts for the deposit of Banker's Credit. It is at best an unfortunate error. That Irving Fisher and Milton Friedman should have verified and built upon this error is extremely unfortunate. That econometrics and monetarism have been accepted and used extensively today is unbelievable, when one considers the reasoning used to support modern money theories. “Fiat money is acceptable because people know money’s true value is its purchasing power its ability to buy goods and services. Federal Reserve Bank of New York Pub. Today, there is not enough gold or silver coin interchangeable with flat. Fiat was acceptable originally because it was interchangeable with the precious metal coin (barter), but now the barter has been eliminated and we are using only the memory of barter. Modern money is strictly mental. However unbelievable that may be, it is fact: dollars are make-believe units of modern, mental money, the Greatest Hoax on Earth. Coin and currency are Legal Tender, money the government says has to be accepted if offered to settle a debt. But that approval doesn’t make cash any more “real” than checkbook balances. … by far the largest proportion of currency now issued is in the form of Federal Reserve notes. At the start of 1977 these comprised more than nine-tenths of the nation's currency in circulation. Board of Governors of the Federal Reserve System Pub. At present money is an intangible (unreal) medium of exchange that is Legal Tender (legal to offer) and is represented tangibly by paper and metal tokens. Neither paper currency nor deposits have value as commodities. Intrinsically, a dollar bill is just a piece of paper. Deposits are merely book entries. Coins do have some intrinsic value as metal, but far less than their face amount. “What, then, makes these instruments checks, paper money, and coins acceptable as face value in payment of all debts and for other monetary uses? Mainly, it is the confidence people have that they will be able to exchange such money for real goods and services whenever they choose to do so. Federal Reserve Bank of Chicago Pub., Modern Money Mechanics, p. 3. “… it is the confidence people have …” that gives “value” to Federal Reserve notes, that haven’t any value in themselves and cannot be redeemed or exchanged for anything of value at their source. Federal Reserve notes (dollar bills) are pieces of paper that serve only as tokens to represent an unreal (intangible) medium of exchange, and whose only value is their continued acceptance by people with confidence. Dollar, which was a word to express a quantity of gold or silver in the form of a coin, is now a word accepted as a unit of this imaginary medium of exchange — mental money. These imaginary dollar units are represented by Federal Reserve notes. A Federal Reserve note is a paper token, as evidence of a created dollar quantity of imaginary debt, written as a number entry on the books of a commercial bank. It is printed at the Bureau of Engraving and Printing on orders of the Treasury, signed by officials of the Treasury, given to the Federal Reserve for distribution, and accepted by the borrower as a medium of exchange for goods and services of value over a thousand times greater than the Federal Reserve note (dollar bill) itself. Obtained from commercial banks by borrowing, Federal Reserve notes have no value as commodities, “… a dollar bill is just a piece of paper …” (quote above). When Federal Reserve notes are used to purchase something of value, their value becomes that purchasing power. 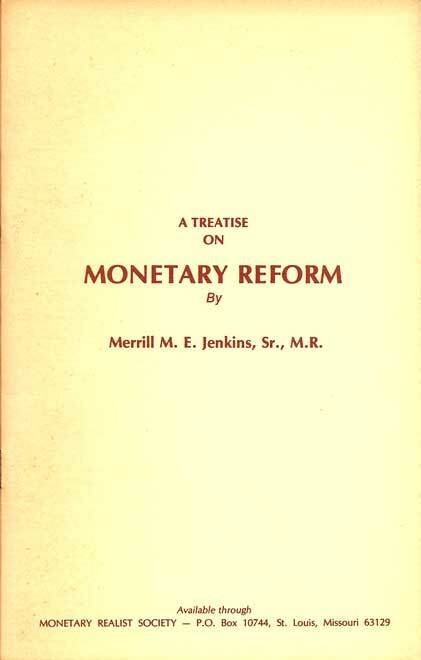 At the time of borrowing, their value “… has little but bookkeeping significance … “ Their value depends on confidence, and the confidence is not guaranteed by anything that the note could redeem; until a purchase is accomplished the confidence in the note (dollar bill), or the imaginary medium of exchange (mental money) it represents, is in reality, unjustified. Currency backing isn’t relevant in today’s economy. Currency cannot be redeemed, or exchanged, for Treasury gold or any other asset used as backing. The question of just what assets “back” Federal Reserve notes has little but bookkeeping significance. Federal Reserve Bank of New York Pub., I Bet You Thought, p. 11. Buying and selling with mental money is nothing more than a gigantic confidence game. Mental money is just a medium of exchange that does not have any value itself except to the one who gave something of value for its proxy representative (Fed. notes). Like a poker chip, that value will only be worth something if the money’s holder can eventually obtain something of value from someone else. No matter whether it is Federal Reserve notes, copper-nickel token coinage or credit cards used in purchases, the dollars they transfer ownership of are only imaginary mediums of exchange (mental money). Using a medium of exchange that is entirely devoid of any substance permits its quantity to be limited only by human imagination, but goods and services depend on human exertion applied to resources over time to come into being. The producer's willingness to accept mental money for the things he produces and/or the labor he performs is the key to the system being able to work at all. Money works when others are willing to accept it. In a modern economy, this General Acceptability rests on a nation's ability to keep money’s purchasing power relatively stable. Federal Reserve Bank of New York Pub., Money and Economic Balance, p. 6. It is not the nation's ability! It is the producer who decides what he will offer for a unit of mental money, because he thinks its purchasing power is guaranteed (his confidence). It is the value of goods and/or services someone offers for a dollar quantity of mental money that gives that dollar its value. The dollar's value always has been determined by the amount of goods and services it can buy — its purchasing power. Money of unlimited quantity, created at no cost, being bid for the goods and services of the public that has to work for each and every dollar quantity of mental money does not guarantee stable prices. Those who create the mental money and get everything for nothing will always outbid those who have to work for money. Two much money results in excess spending. When consumers, businesses and governments spend excessively they compete for the available supply of goods and services and force prices up. When prices rise, the purchasing power of money fails. To keep purchasing power strong, then, the supply of money must not increase too rapidly. It is important to note that the purchasing power is not a result of the quantity of money available but how much is being spent. As its purchasing power falls more will be spent (rapidly rising prices cause apprehension and people increase buying instinctively). The more spent the further it will fall. The ability of all money users to produce enough goods and services to absorb all debt being Monetized is the key to a modern money system remaining stable and holding its value. When money’s value is the product or service it will buy, only those producing and/or performing service can give money value. Only by producing goods, performing service and accepting money can the public give money value. It is the public's I.O.U.s that are the debts Monetized into mental money. Commercial banks are important financial institutions because they can create money — checkbook money. When we borrow $200 at a local bank to buy a washing machine we sign an I.O.U. and the banker writes a slip for a $200 addition to our checking account. No one has any less money on deposit, but we have more. The banker has bought our I.O.U. with new demand deposits — checkbook money — which were created. Bank credit and checkbook money have been increased $200. The Banker buys our I.O.U. by furnishing the checkbook money we need as a medium of exchange to get the washing machine. We pay for it with the money we have accepted for our goods and services. The banker does not produce goods or perform services that give money value. The formalities of borrowing and signing I.O.U.s are an attempt at controlling our spending, so money will keep its value. This is a false conception which has been exposed by money’s inability to maintain its value. It is not the quantity of money that gives it more or less value, it is the quantity being bid for goods and services that raises or lowers its parity. If the commercial bank could not create money to buy I.O.U.s — unless they produced goods and performed services for money — then the money’s value might remain stable. A healthy money depends on balancing the growth of the money supply with the economy’s ability to produce goods and services. The quantity of money that people have in their possession came about by someone working for it. It was paid for by their labor. The imbalance comes about by the fact that commercial bankers have money they did not pay for. It is monetizing I.O.U.s that creates free money, and this causes the imbalance. We … make most payments with checks — Checkbook funds, bookkeeping entries in banks' ledgers and computers, are mainly created by the lending activities of the nation's 14,700 private commercial banks. Federal Reserve Bank of New York Pub., The Story of Money, Back of Front Cover. Fourteen Thousand Seven Hundred (14,700) commercial banks creating money, and not one of them accepting money for any produced goods or performed services. Fourteen Thousand Seven Hundred commercial banks have created a quantity of purchasing power so huge it defies comprehension. This huge quantity of money has been created and is held in a non-bidding state by being invested in various accepted ways: Pension Funds, Savings Accounts, Series “E” Bonds, Treasury Bills, etc. The daily exchange of G.N.P. (fourth quarter ‘81 ) is equivalent to 8 billion dollar quantities of mental money. If a lack of confidence in money caused the Series “E” bond holders to cash in 10% of their eighty billion dollar quantities of money in any one day — and bid it for G.N.P. — prices might well double. If 10% of 80 billion in Series “E” bonds seems too large a reaction, then look at 2% of the 370 billions in savings accounts; it also might well double prices in any one day. The conditions existing today are such that this could happen at any time. A reaction of this type could trigger an avalanche of spending that would drive prices upward (money depreciating) explosively. Once a runaway money depreciation begins there is virtually no way to halt it. Federal Reserve notes represent a money that is imaginary. Without anything to be redeemed there is no way by which they can be canceled. This means we have a game of musical chairs, without the chairs. Money creation bookkeeping isn’t gimmickry. Far from it. Banks are creating money based on a borrower's promise to repay (the I.O.U.) … Banks create money by “monetizing” the private debts of businesses and individuals. That is, they create amounts of money against the value of those I.O.U.s. Federal Reserve Bank of New York Pub., I Bet You Thought, p. 19. For a debt to exist there must be an incomplete exchange; debt is the undelivered part of an exchange. For the debt to be settled the remaining part must be delivered. “… Banks create money by monetizing the private debts of businesses and individuals.” We are to assume from that direct quote, (above) that debt (the undelivered part of an exchange) — by some mysterious process called “monetizing” — becomes the delivered equivalent part as well. (Reality would have named it “mentalizing” money instead of Monetizing” debt). Debt as debt is the undelivered part of an exchange. Debt as money is the delivered equivalent part of an exchange. “Monetized” Debt is an inconceivable concept! Federal Reserve Bank of Chicago Pub., Two Faces of Debt, p. 1. Debts are debts on one side of the ledger. Debts as assets on the other side. How does one keep books? The debit side is accounts receivable received. The credit side is accounts receivable issued. There cannot be an accounts payable without a medium that can pay. Bookkeeping no longer determines net worth, but instead — net deferred debt. Non-payment of debt forces perpetual accumulation of debt. A large and growing number of analysts, on the other hand, now regard the National Debt as something useful, if not an actual blessing. Federal Reserve Bank of Philadelphia Pub., The National Debt, p. 2. Since debt cannot be paid, why not say: “Well! We don’t think debt should be paid.” Then it is only a small step to where you can say: “Well! In reality debt is a blessing!” It isn’t any greater madness to think and say those things when you are totally unable to justify the monetized-debt-madness to begin with. Many modern economists believe … the National Debt need not be reduced at all … Debt has a deceptive, something-for-nothing kind of charm … spending tomorrow's income for today’s goods and services is a legitimate and valuable practice. Federal Reserve Bank of Philadelphia Pub., The National Debt, p. 11. Debt — public and private — is here to stay. It plays an essential role in economic processes … What is required is not the abolition of debt, but its prudent use and intelligent management. Federal Reserve Bank of Chicago Pub., Two Faces of Debt, p.33. If there is no intention of settling debt, won’t it accumulate to the point where lenders have to ask to be repaid and a possible United States bankruptcy results? Bankruptcy, in simplest terms, occurs when lenders demand repayment and the borrower can’t make it. What are the chances that a significant proportion of the lenders of the National Debt will demand repayment? Federal Reserve Bank of Philadelphia Pub., The National Debt, p. 8. The whole structure of monetized-debt as money, or debts-as-assets rests on the holders of the evidence of debt (the lenders) never demanding repayment. Only if debt is accepted as perpetual can it continue much farther into the future. Does that mean that if the non-bank public asked to be repaid the United States would suffer bankruptcy? Nevertheless, let's suppose a great number of lenders (holders of government securities) decided to demand repayment all at once. Could the borrower make it? The Federal Government, with the cooperation of the Federal Reserve, has the inherent power to create money — almost any amount of it. This power makes technical bankruptcy out of the question. Federal Reserve Bank of Philadelphia Pub., The National Debt, p. 9. “This power makes technical bankruptcy out of the question …” We cannot go bankrupt? Debt is now perpetual? Bankruptcy has been eradicated from the books of natural law! At what price? Yet this power also makes it possible for governments to pursue policies that could have even more disastrous results than bankruptcy. The power to create money can result in a condition more disastrous than bankruptcy: Monetary collapse! A collapse of all confidence in money, a condition the world has not seen since the Dark Ages. The belief is widespread that the current monetary crisis marks the end of an epoch. It is open to question whether this should be interpreted as the end of the postwar period or whether — and this appears to be more probable — the loss of confidence in the stability of currencies heralds an historical change. Credit Suisse Pub. The Monetary Crisis in the Light of Contemporary History Vol. 31, p. 3. “It has happened in other countries. Governments have created too much money and accelerated inflation to runaway proportions. Soaring prices then reduced the value of interest-bearing securities to next to nothing. Many leaders and investors were severely hurt or completely ruined. Runaway inflation, soaring prices, interest-bearing securities to zero value, lenders and investors completely ruined. Loss of value due to bankruptcy could hurt all those invested with the entity going bankrupt — company, nation or world, but a loss of all confidence in money itself is tantamount to total collapse of current means of determining exchange parities. The public has used monetary exchange parities as the very base for the distribution of all production. More disastrous than bankruptcy, more disastrous than total loss of confidence in all money is the loss of the facility of money. The use of money which was originally called barter lifted the world out of barbarism into civilization. The loss of the facility of money can collapse our modern world into the abyss of a new dark age. Let us face it? There is no international monetary order — all we have is disorder, sometimes chaotic disorder. Could this power, to create mental money that can make bankruptcy out of the question and bring about a new Dark Ages, perhaps, prevent the inevitable collapse the same way it abolished the natural law of bankruptcy? No parliament in the world will ever be powerful enough to override market forces for any length of time. This basic truth is unfortunately often forgotten, especially when election pledges have to be redeemed. Swiss Credit Bank of Zurich Pub. #31, The Monetary Crisis in the Light of Contemporary History, p. 13-14. If they are not solved in good time, the price that will have to be paid for monetary disorder will be too high for Switzerland and for the Europe in which we live. The price will be “… too high … for Switzerland and Europe” but what about the price the United States is already paying in part? The Monetary Crisis, p. 23. The Arabs have multi-billions, Europe has multihundred-billions, and all imaginary mental money units as worthless as bad checks drawn on insufficient funds. What should they do with bad checks written by an entity on the verge of something more disastrous than bankruptcy. They are buying anything they can get with them, to be rid of them, before total loss of confidence reduces their exchange value to zero. They are buying land, buildings, businesses, banks, arms, anything before the collapse. Anything but things that they produce at home. Importing too much of the things that they produce would ruin their nation's economy prematurely. The attitude of the average U.S. citizen is quite different since the view of the relatively minor importance of external trade for his country, he is not impressed by overseas opinion concerning the U.S. currency. We are being outbid for our own goods, with our own money by foreigners. Like Argentina that produces beef but cannot afford to eat beef, that is the fate we are moving toward. A heritage born out of the inherent power of the Federal Reserve to create mental money. This power must be ended. No one should have the power to create an order upon the production of others. What must be done now is more imperative than it was when the Continental dollar was ended. The Legal Tender Acts must be reversed. The holders of Federal Reserve Notes and claims to demand deposits must be able to use them to bid for the titles to wealth, still remaining, that were acquired by the issuers of the Federal Reserve notes, at the time of their issuance. From that same point in time any bank should be permitted to issue 100% redeemable currency upon 100% deposits of tangible commodity; just as it now issues cashier's checks. There should be strict laws against “all” counterfeiting. Certificates of deposit should be issued, specifying the units and purity of the wealth on deposit, and available at any time for redemption by the certificate's holder. No individual should write a check without having made a wealth deposit to cover it. No warehouse should be permitted to issue certificates for material not in storage! No bank should be permitted to issue one more unit of certificates than it has deposits to cover. Inter-bank currency clearings would function exactly as check clearings do now. The uniform wealth coinage, fabricated by government, exactly as in the Free Coinage of the past, would permit coin deposited at one bank to redeem the currency of another bank. A minimum of actual shipping of coin would be required occasionally to settle the balance of accounts. The Free Coinage aspects of this system guarantees an adequate quantity of coin wherever and whenever it is needed. Justification: Natural Law forces a discipline upon the use of precious metals coin as barter that cannot be matched by man-made law. Value is a human concept, that is, it is subjective. Parity is the value of something expressed in terms of another thing! Since all humans create their own sense of values — nothing has a fixed value or a constant parity. Currency redeemable in gold coin would represent that gold coin by proxy, and have the parity of the gold (weight and purity( in the coin represented. Currency exchange value in relation to commodity of service would be exactly that of the wealth it can redeem. No one should attempt to fix the parity of any currency in relation to any other currency or commodity, domestic or foreign. Natural Law regulates parities in a free market. Parity changes inspire increases or decreases in production of various commodities and offerings of services. This Natural Law regulation assures adequate volume of all goods and services except when shortages develop due to natural causes. Adherence to the Natural Laws of a free market would permit complete compatibility to multi-metal 100% redeemable currency systems. A free market is one in which the public is able to exchange production or services by competitive bidding, open to all, in the absence of any government restriction and subject only to its own self-imposed restrictions. In a free market, all commodities must be free to seek their own parities in relation to all other commodities — without exception — or the market is not free. A free market is only possible with Free Coinage, and government minting is limited to control over weight, purity and striking of the precious metal they coin. The quantity of coin produced is limited to the amount of precious metal brought to the mint by the public for coining, thereby assuring adequate volume at all times. Natural Law would again be the determining factor. At present the entire world is using currencies representing monetized debt as the money. Any attempt to shut off this money before the introduction of “sound” currency to take its place would spell instant worldwide monetary collapse. At present, in virtually all modern monetary systems the base consists of either central bank liabilities, government liabilities, or both. These items are the ones used to settle inter-bank debt and some circulate as money. Federal Reserve Bank of St. Louis Pub., Review, November, 1976 p. 4. Here at home, the American public must have its U.S. Constitutionally guaranteed right of contract restored. The Legal Tender Acts must be repealed and the new ‘sound' currency introduced. The old irredeemable currency would gradually but increasingly depreciate until it ceased to be used by anyone. The introduction of a new 100% redeemable currency put into use, would force out irredeemable currency by the discount that would expand between the two currencies. Gresham's Law, which is often cited, states: “Bad money drives out good.” It does not explain that it only occurs when the bad money is made Legal Tender! Repeal the Legal Tender Acts, as suggested above, introduce 100% redeemable, 100% reserve deposit currency (good money) and it will drive out the bad money. As soon as all the Federal Reserve Notes and all demand deposits are gone, the Legal Tender Acts should be finally abolished. The secret of good government, peace and prosperity lies in the ownership of the medium of exchange. When the people own the currency and coin they use, then government depends on the public's support for its survival, and the public directs the policies of government. If any other entity owns the medium of exchange, that the public is forced to use — that entity directs the policies of government and through government, controls the people. It is the product of a prodigious collective error which will remain in history and will eventually be recognized as an object of astonishment and scandal. Our right of contract was lost when the words: “This note is Legal Tender for all debts public and private” replaced: “pay to the bearer on demand” on our currency. Our right of contract and freedom will return after we have returned to a 100% coin reserve for a 100% redeemable currency and all Legal Tender Acts have been abolished. Specifically, I propose we do not permit our nation to be sacrificed on this treadmill to financial oblivion, but that we rescue it now by initiating Federal Reserve bankruptcy proceedings. Consider the Fed. notes held by their holders as valid claims upon the remaining wealth in the hands of the Fed. note issuers. Audit that remaining wealth and auction it off bank by bank, holding company by holding company, allowing the holders of Fed. Notes to bid freely. Those who will accept less as a settlement of claim will bid highest. Those who wish greater settlement of claim will bid lowest. This procedure would guarantee to all holders, a greater return than if all Fed. Notes were allowed to become worthless. This procedure would be more equitable than a deflationary exchange that would rob all Fed. note holders, and allow the bankrupt to retain title to all the loot gained by their issuance. Immediately upon a successful bid, all Federal Reserve Notes or demand deposits represented by check would be destroyed until the books were clear. This proposed reversal of the Legal Tender Acts would guarantee the most honorable and most equitable bankruptcy proceedings under the conditions that exist. Bank Presidents, as well as employees, who are holders of the monetized debt currency would be permitted to bid at the auctions. Only that wealth, still remaining, that was acquired by the creation and initial issuance of the monetized debt currency would be forfeited by the bankrupt. That wealth not remaining had been lost forever and cannot be retrieved. No purpose would be served by retribution. All the irretrievable wealth lost to the non-bank public should be considered by them as the cost of their education. Never again should the non-bank public allow themselves to become unaware of their responsibility to be constantly alert. It should be realized that it took many generations to develop and perfect this hoax. The exact purpose or intention of its founding bankers has been gradually obscured over time and is lost to us today. Whether it was altruistic or personal greed we cannot punish the original instigators, and it would be impossible to prove evil intent on the part of the present day perpetrators of the hoax. Modern bankers are themselves victims of the hoax too. The entire world's population is to some degree a victim of this money hoax. The implementation has been so gradual and subtle that very few will accept the existence of the hoax even now. The bankers actually involved in the hoax are not aware of the significance of what they are doing. I doubt that monetization of debt has been a conscious act on the part of government or on the part of the Federal Reserve System. I am beginning now to wonder whether I finally grasped the significance of what we were doing, at the time, and of the causes for the action we were initiating. Robert V. Roosa, Former Asst., Secretary of the Treasury, 1973. Being unaware of the true significance of what they have been and are doing assures that it will be doubly difficult for them to accept the viability of the solution suggested here. Everyone seems to accept that if it had not been for the mental money we would not have had the progress to date. That is a misconception easily dispelled. Everything accomplished to date is the result of the efforts of human beings. To say that monetized debt made it all possible is to ignore the primary function of monetized-debt-money. Inflation, even if correctly anticipated, reduces the wealth of money holders in proportion to their holdings of money. Federal Reserve bank of St. Louis, Review February, 1975, p. 19. Humans built the buildings, humans dug the canals, humans grew the food, humans built the ships, etc. All the money ever did is expropriate the title to wealth. Those who did the work very seldom became the owners of the results of their labor. Everything that was accomplished during the periods of inflation (monetized debt) could have been accomplished if wealth had been used as a medium of exchange instead of money. When gold and silver coin were the U. S. money of account, it did not matter that they were called money! Gold and silver is wealth, is produced by human exertion, is barter per se or a medium of exchange determined by its use. Loans were made with gold and silver coin. Projects were financed with gold and silver coin. All manner of sound banking techniques were just as viable and facilitating as any false medium, but a gold and silver sound medium would have guaranteed that the general public who did the work would have owned the benefits derived therefrom. The problems and misery suffered by non-bank public has never been due to the techniques of sound banking; that belief is a monstrous misconception. The fault has always been with the nature of the medium of exchange. Every economic professor, government advisor, financial advisor, economist of the Keynesian, Monetarist and even Austrian schools, say inflation is a CONDITION caused by an excess QUANTITY of money chasing too few goods, and that the solution is to increase productivity. It has always been, it is now, and it will always be that, if the NATURE OF MONEY is anything but production, it will exceed production by whatever they call that — non-production — excess. Inflation is not a condition. It is a thing. Inflation is an imaginary medium of exchange — money — monetized debt! Inflation is a thing that cannot register on the five human senses. Money that cannot register on the five senses is imaginary money — monetized debt — that is, inflation per se. Production in any form as the medium of exchange cannot exceed itself! Surrendering real for unreal, wealth for monetized debt tangible for intangible, in all cases is the expropriation of private property by the creators and issuers of the unreal, monetized debt, intangible medium of exchange. It is the nature of it being unreal, and intangible that facilitates the expropriation. From the first unit to the last, inflation is always 100% fraudulent acquisition of the producer's wealth by those who do not produce any tangible thing. This invisible robbery has been going on intermittently for the past 200 years of United States history. The title to Wealth passing into the hands of the money creators is equal to the exact amount of money created — 100%. 1 unit of “money” is 1 unit of expropriation is 100% inflation. 1,000 units of “money” is 1,000 units of expropriation is 100% inflation. 100,000 units of “money” is 100,000 units of expropriation is 100% inflation. Inflation is the thing — monetized debt — money — imaginary medium of exchange, is always 100% of the amount issued whatever the actual count of units. If the medium of exchange was all produced goods or human labor performed, the total amount that could be exchanged would be 100%. If any part of the medium of exchange was intangible the total quantity that could be exchanged would be 100%, of all that had been issued. The quantity of intangible or tangible mediums of exchange being bid for production determines the parities of units of production in relation to the units of medium of exchange (usually referred to as prices). These parities are determined by the quantity of units of medium of exchange being bid per unit of production available not by the total quantity of money. The existence of the imaginary mediums of exchange permits the bidding per unit quantity (of money) to exceed the production unit quantity. If that excess is bid the parity of production will rise in relation to units of money. This could not happen if all mediums of exchange were production. If all mediums of exchange were production — which would be all the goods and services available for exchange — it could not exceed itself (100%). When real (tangible) mediums of exchange are removed and replaced by unreal (intangible) mediums of exchange, their nature of being imaginary permits their quantity to increase as a ratio in relation to the quantity of units of production available for exchange; imagination can conceive faster than goods can be produced or services performed. The quantity of the intangible medium of exchange is Constantly accelerating. It is this quantity being bid per unit of goods and services which causes price escalation. Since no amount of monetized debt can be any amount of debt settlement, the fraudulent acquisition is constant at 100%. The ever increasing price escalation in no way increases the percentage of expropriate, but the increase in the quantity of money increases the quantity of fraudulent acquisition. Prices rising expose the fraudulent acquisition but do not affect the rate of inflation which is constant at 100%. What makes the truth appear strange and confusing is the fact that no one ever works for the money per se, but works for what they intend to exchange the money for. All exchanges are really exchanges of the result of one individual's human exertion for the result of another individual's human exertion. Swapping the results of human exertion for the results of another's human exertion even though money may be used as a medium of exchange does not alter the fact it is eventually indirect barter. The use of monetized debt represented by Fed. notes as a medium of exchange allows the prices rising to expose the depreciation of the Fed. notes in their primary function of expropriating wealth by fraud. The changes in prices (parities) expose the lowering parity of Fed.-note-represented monetized debt units in relation to goods and services available. The fact that all goods and services exchanged for Fed. notes are 100% fraudulently acquisitioned by the nature of the money itself does not permit prices rising to affect the rate of inflation. All that the non-bank public produces and exchanges for Fed. notes is 100% expropriated by inflation (modern money), there isn’t anything remaining to be affected in any way by price changes. Price changes are the parity ratios adjusting to the excess quantity of imaginary money units being bid as mediums of exchange: money is not an end in itself. If money is worth less at the time of its use in bidding than when it was acquired, it can appear that its depreciation was injustice, but it does not change the rate of inflation or expropriation which was accomplished with the money issuance (i.e. 100%). It is failing to consider the time factor that causes the confusion. Money, being intangible, expropriates by 100% whatever it is initially exchanged for at the time of issuance. After its initial primary function — that of expropriating wealth — has been accomplished with its issuance, its further use is simply as a medium of exchange and its depreciation as a medium of exchange can favor the debtor over the creditor, but cannot affect the original rate of expropriation which is a constant 100%. If the expropriation of wealth had not been acquiring the ownership of everything for the issuers of monetized debt; everything would still be there, but it would be owned by the producers (the non-bank public). Bankers own the earth. Take it away from them but leave them the power to create money and control credit, and with a flick of a pen they will create enough to buy it back. If, however, a government refrains from regulation and allows matters to take their own course … the worthlessness of the money becomes apparent, and the fraud upon the public can be concealed no longer. The prime function of government is the protection of the different and unequal facilities of man for acquiring property. No other rights are safe where property is not safe. The nature of “money” is at the root of all our problems. There is not any undesirable condition in our nation today that cannot be accurately and totally traced back to the root of all evil, the power to create money. It is not who has the power to create money that is the root of evil. It is the power to create money at all! There is only one way to abolish the evil of money creation — abolish money. Money is an abstract term that was applied to barter in error. Money is an abstract term for the mental entity that has replaced the barter. No person or agency, government or private, shall determine what anyone must accept as Lawful Tender! No coins shall ever be minted bearing an abstract monetary term. All coin shall bear its commodity specification, fineness of purity, and weight specification, such as G.999-1,000 gr. (Gold .999 Pure 1000 Grains) or S.999500 gr. (Silver .999 Pure 500 Grains) or .999-1500 gr. (Platinum .999 Pure 1500 Grains) or C.999-750 gr. (Copper .999 Pure 750 Grains), etc. No person or agency, government or private, shall determine how many of any coins of any commodity shall be coined. No person shall be prohibited from bringing metal of the proper coin purity to the mint for coining free of charge with the costs of minting to be paid out of general funds of the government. No person or agency, government or private, shall set any value or parity between the coins as minted and any other commodity or between the coins themselves. No person shall be prohibited from fabricating coins of private design, using the same marking system described above, using any commodity, in any quantity, but there shall be severe penalties for any improper marking. Banking procedures shall remain relatively the same as they have been, except that all bookkeeping and check writing must specify the commodity and its weight deposited or ownership transferred. All state and federal taxes shall be payable in gold and/or silver coin. All state and federal expenses shall be paid with gold and/or silver coin as specified in its contractual arrangements. Checks may be used to transfer ownership of government coin. The specifications, as outlined above, would cancel the injustices and corruptions being suffered daily in our nation and true progress would be resumed.